April 03, 2019: Powerful results or a light as air finish? Why should women have to choose? Whilst many creams promise lightweight skincare, they can still leave skin feeling greasy, sticky or they don’t deliver skin benefits beyond basic hydration. Enter Olay’s game-changing facial moisturiser; NEW Olay Whip. The Whips range has been created by Olay scientists to give women the light as air finish they’ve been missing from their lightweight skin creams, together with powerful results. Olay Whips features Active Rush Technology™ which has the ability to hold and quickly release 1000x its weight in hydration and active ingredients. Whips transforms from cream to liquid on contact, flash absorbing into skin to deliver potent anti-ageing skincare with a light as air touch. Dr Frauke Neuser, Olay Principal Scientist comments: ‘This new technology effectively re-writes the rules on how to formulate a facial moisturiser. Previously, there were two main ways when it came to adapting skin creams – adding either more oils or more water to change the feel and finish of the cream. Olay Whips’ Active Rush Technology™ is a new third way, creating a unique 3D structure in the jar and on the skin, and enabling a smooth, matte, light as air finish’. 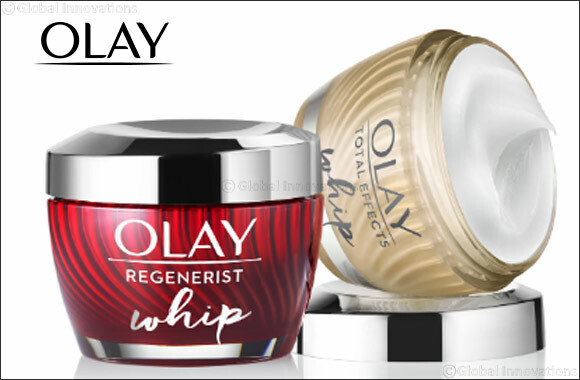 Olay Whip is available with and without SPF30 and comes in Olay’s three powerhouse variants; Olay Regenerist and Olay Total Effects. Each provides youth-restoring benefits, whether you’re looking for smoothness & firmness, tone perfection or overall nourishment. NEW Olay Regenerist Whip Moisturiser diminishes the look of fine lines and wrinkles whilst actively hydrating to improve elasticity and firm skin for a lifted look and feel. Formulated with Active Rush Technology™ with advanced Amino-Peptide Complex II to regenerate surface cells, it actively hydrates to improve elasticity and firm skin for a lifted look. RRP AED109 Available both with and without SPF30. RRP AED 109 Available both with and without SPF30.